The Republican National Committee had a big mix-up Monday when it urged readers to get out and vote in the New Jersey special election for Senate on Tuesday -- an election that's not taking place until Wednesday. 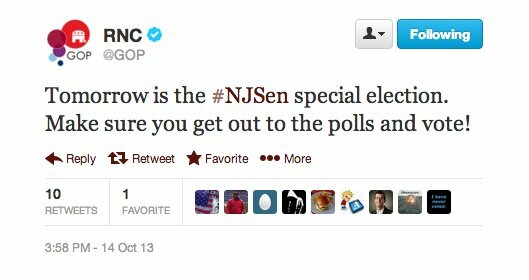 Wednesday is #NJSen special election. Make sure you get out to the polls and vote! Newark Mayor Cory Booker (D) is facing off against Republican Steve Lonegan for the seat of the late Sen. Frank Lautenberg, who died in June 2013. It’s sad to see Huffington Post’s breaking news standard is the RNC making an honest mistake while urging voters to do their civic duty and vote in the upcoming New Jersey election.